Cost-effective localization for large-scale Geosocial networking service is a challenging issue in urban environment. 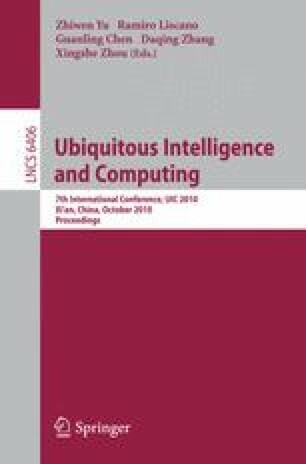 This paper studies an ad-hoc localization technique which takes advantages of short-range interchanged location information for calibrating the location of mobile users carrying non-GPS mobile phones. We demonstrate by simulation that a small percentage of GPS-enabled mobile phones can greatly enable the localization of other non-GPS pedestrians in the urban environment. Based on the proposed localization technique, we implement a location-aware social networking tool called Mobile Twitter, similar to the microblogging service of Twitter, for fast propagation of social events happening in surroundings. Evaluation shows the our localization algorithm can achieve better accuracy of the location estimation and wider coverage as compared with the Amorphous algorithm and the Monte Carlo Localization (MCL) method. Moreover, we show that the Mobile Twitter implemented on an Android mobile phone is power-efficient in real-life usage scenarios.